Over the course of the last several years working to promote permanence and improve adoption and guardianship preservation and support, the QIC-AG has developed several insights that we want to share with you. Each month for the next few months we will be sending you a “message of the month” focusing on one of the insights with links to more information. 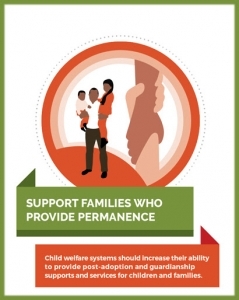 This month the QIC-AG is featuring its first message: Support families who provide permanence. This is one of the more simple but foundational insights and can’t be overlooked or underappreciated as we think about the need for child welfare systems to increase their ability to provide post-adoption and guardianship supports and services for children and families. Some of these messages reinforce what many of us already know and validate what we are already doing in our work to support families. Some are more complex concepts that may be challenging to integrate. We hope all of these insights inspire you as they have us and highlight the urgency of needed changes in perceptions and actions on behalf of the families and children who are moving toward adoption or guardianship as well as those that have already moved into these permanency options. Ensure supports are available to families who adopt children privately (domestic or inter-country).